The story of the Mendoza Fly Shop, is the story of a man and his family. They set in motion a commercial entrepreneurship specialized in fly fishing, a project that played the lead in the introduction and diffusion of this discipline in Argentina´s arid west region. The pioneer was Benito Perez, who since childhood was interested in fishing, and went all over the rivers and canals of his province with his farmer father. These riverbeds carry, many times muddy, smelt waters from the Andes Range, that flow in the middle of a dessert where the irrigation is vital to unleash a productive economy from which, in beautiful oasis and numerous wineries, the best argentine wine are brought to life. 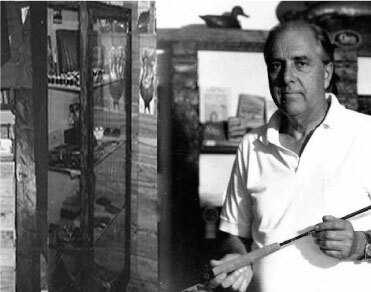 IF BENITO WAS A VISIONARY, THE MENDOZA FLY SHOP IS ALSO THE WORK OF HIS PARTNER AND SON, AND NOWADAYS MAIN RESPONSIBLE PERSON FOR THE COMPANY, PABLO RODRIGO WHO WAS HELPED BY BENITO HIMSELF AND HIS WIFE MARGARITA SINCE HE WAS LITTLE, ALMOST A TEENAGER. it in the year 1968; his curiosity was aroused by the invertebrate fauna that served as food to these magnificent fish that fought valiantly when caught by his hooks. Benito practiced the discipline with Allan Fraser, whom he considered his mentor in fly fishing, and then he met the main characters of the specialty in Argentina and the countries he visited. During the gained experience on these environments, special attention was paid to the entomology of the Andean streams, based on the studies carried out by Benito Perez which have been portrayed in his book "The Fly", a delightful piece of work that includes from the description of the invertebrate beings that live in the water or near it to the recipes and songs linked to fishing in Mendoza, book that is currently internationally renowned in the fly fishing literary world. 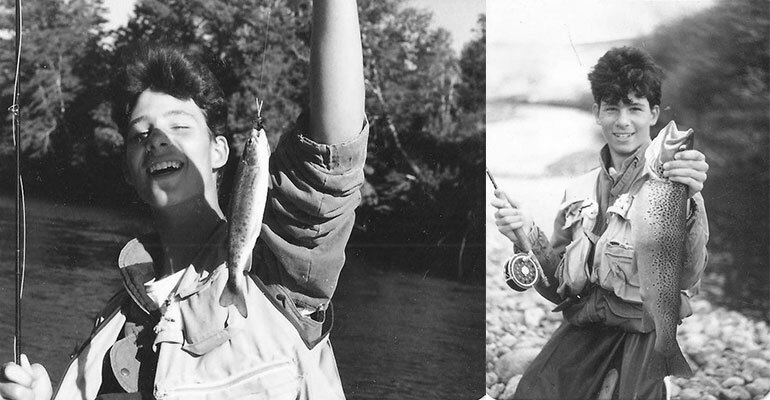 In 1993 only a few fortunate people knew about fly fishing in the province of Mendoza and Argentina, but there was practically no local offer of gear to practice it. The Perez family decided to invest in Orvis, so that people from Mendoza could learn the art of "flying" an artificial fly. The Orvis Company Inc. was chosen as a supplier due to its reputation as the fly fishing world leader. A family business is born; the province´s first fly shop, a shop that today is the leader in the trade within Cuyo´s region and an obliged reference in Argentina. Endearing Friends from numerous fishing trips by the rivers of Mendoza and the mythical Patagonia were the first to arrive. Those customers brought other customers that also became friends. In October of the following year (1994), once that Pablo finished his studies as a mountain guide, he started to run the business. He had learned to fish since he was a child, guided by his father, but at that time he had already perfected his fly cast and tie knowledge becoming an instructor and guide in a short period of time. In the year 2000, a superb and unprecedented project was started in the province of Mendoza, since floating the Río Grande in a raft for the first time was decided (at the southern district of Malargüe), one of the great affluents that form the Colorado River, that serves as the north border of the Argentine Patagonia. It was a historical event in the region. In August of the year 2000 the first Orvis Fly fishing site for Argentina was opened www.mendozaflyshop.com with the aim to offer the fishermen all the necessary information regarding gear, fishing techniques and environments where to practice their favorite hobby. Fruit of the experience at the rivers and the permanent work in teaching, fly patterns were created, that today are well known flies at provincial and national level, such is the case of the nymphs like Massarta, Perez Destroyer, Perez Castaño, O.C, among other. The new guided tours project that kept the professional level that already characterized the company started working in the south of Chile at the IX Region, fishing at the beautiful Allipén River where King Salmons that might weight 30 kgs go upriver. After that, the work team started to operate in Junin de los Andes in Patagonia and it formed a new base in the legendary Malleo and Chimehuin rivers for 7 years. Great experience was gained in the field by working with an important flow of foreign customers. Another set and achieved goal some time after was the fulfillment of the dream of an on-air TV program dedicated to fly fishermen. It was like this that the show Aguas Claras Fly Fishing TV & DVD become the first TV show dedicated to fly fishing at the Argentine west center. While the experience at Mendoza´s settings continued growing day by day, working with a flow of foreign public, the Mendocinian environments where fly fishing with dry flies and nymphs at small rivers and mountain streams were revalued. This makes it to require certain polished techniques for those special environments, completing a demanding fishing, different and amusing, not only for the expert fishermen but also for those who take their first steps. Our work team and guides count with a very good experience and skills and with a deep knowledge of our environments that make that the stay of people from anywhere in the world to be an unforgettable experience. The mythical wooden cabin, the company´s headquarters, is located at Brandsen street, in Dorrego in the Mendocinian department of Guaymallén, where people could always share a coffee, served by mamma Margarita, forever honoring the great family tradition and professionalism that characterizes us. Hans Hebeisen and his wife (Orvis Switzerland), Mel and Fanny Krieger (USA), Darío Pedemonte, Martín Orellana, Fernando Belert, Pablo Martelli, Luis “Chiche” Aracena, Federico Prato, José María Lozano (Huilliche Argentina), Andrés Morenza and Jean-Jacques Annaud, Pablo Orfeo, Pablo Labarta, Diego Buzurro, “Banana” Martinez, Luis Antúnez (Spain), Luis "Chiche" Aracena, Brett Ference and Leigh Oliva (Orvis USA), Gary Borger (Wisconsin, USA), KC Walsh (President of Simms) Montana USA among other. Pablo Rodrigo says: “we consider ourselves as the keepers of the fly fishing tradition in Mendoza” and he emphasizes that given the story his father started and he continued, that proud is legit.